Finding out that EXID would be co-headlining the 2017 Feel Korea in London event was an announcement that had me absolutely shaking. EXID have been at the top of my stan list ever since their super catchy first single “WHO’S THAT GIRL” dropped in 2011. “WHO’S THAT GIRL” was followed in 2012 by two more extremely high quality singles, “Every Night” and “I Feel Good”, and the Dasoni subunit in 2013. Sadly, K-pop fans remained sleeping on the girls with each release, despite all of their songs sounding like smash hits. The EXID girls kept trying though, and released one more, ‘now or never’ single in August 2014 – “Up and Down”. Upon release, “Up and Down” barely made a dent on the charts, typical of EXID at the time. Since K-pop agencies usually scrape acts into the trash if they don’t eventually take off, this was the fate I had been fearing EXID were facing at this stage. Something miraculous then happened. A fancam focusing on visual member Hani during one performance of “Up and Down” went viral in Korea, skyrocketing EXID to the top of the charts – EXID were finally a hit, and Korea was bald. EXID‘s perseverance finally paid off, and “Up and Down” became one of the biggest K-pop songs of all time. “Up and Down” had such a huge impact that EXID rehashed its brass-driven funky sound twice with “Ah Yeah” and “Hot Pink”, and also started the trend of K-pop groups becoming popular through viral videos. With the 2017 release of Eclipse, EXID are at long last recognized as a top tier girl group. The EXID girls were the only girl group chosen to represent Korea at the Feel Korea in London event, performing alongside boy groups KNK, SNUPER (who I stan now btw) and Highlight (aka Beast). 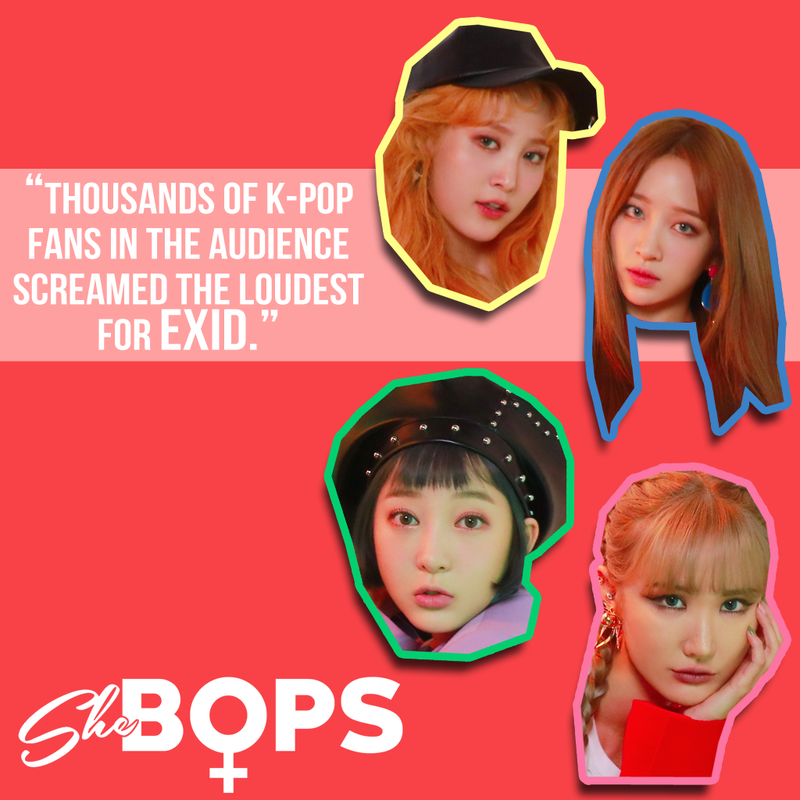 For that reason, I was filled with immense joy when the thousands of K-pop fans in the audience screamed the loudest for EXID’s music videos during the pre-show montages. As a day one stan, it was such a rush for me to witness my girls being shown all of this love and support – a far cry from the rookie days of EXID being the struggling underdogs. This adrenaline rush throughout the crowd was exacerbated when the girls strutted onto the stage in adorable pastel color coordinated outfits to perform their four monster hits: “Hot Pink”, “낮보다는밤 Night Rather Than Day”, “Ah Yeah” and the hit everybody had been waiting for – “Up and Down”. Every flawless move EXID made was met with wild cheers from the audience, as the girls unsurprisingly slayed each song’s iconic dance routine and catchy melodies as the naturally gifted idols that they are. Seeing the girls in person at such a prestigious event after sticking with them since the beginning was truly unforgettable. To me, EXID represent tenacity, dreams coming true and unbreakable resilience. I’m thrilled that EXID are living the K-pop dream, with their appearance at Feel Korea in London demonstrating exactly why they deserve to be.